Dark dusty garnet color. Fruity, toasty aromas and flavors of dried berries, spiced cherries, s’mores, and hint of incense with a silky, vibrant, fruity medium body and a silky, engaging, medium-long finish that exhibits shades of vanilla cream, spiced oranges and apples, praline, and pepper with soft, chewy tannins and light oak flavor. A nicely balanced and flavorful zinfandel with great versatility. Bottom Line: A nicely balanced and flavorful zinfandel with great versatility. 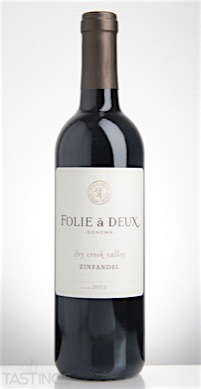 Folie à Deux 2013 Zinfandel, Dry Creek Valley rating was calculated by tastings.com to be 93 points out of 100 on 11/4/2016. Please note that MSRP may have changed since the date of our review.